So y'all know that one of the best thing for my type of skin to dry up acne and help it get back to it original skin tone is a good orange soap and that means kojic all the way! Kojic acid has been in my regimen for more than a decade now because I truly feel it's the only things that truly helps with my acne-prone skin and help remove makeup residue and impurities left over on my skin. And I know a lot of youagrees with me but sadly, not everyone is hiyang. And I get it, orange soaps can sting, drying and cause uneven skin peeling. Not all skin types will tolerate such harshness on the skin. So I'm quite excited that Belo took it upon themselves to create a product to address these concerns. Nope they didn't change the Belo Kojic Acid + Tranexamic Acid we love, they only added more skin caring ingredient to make it better and accomodate more skin type to enjoy its benefits. Belo Kojic Acid + Tranexamic Acid Extra Moisture has a good amount of glycerin (the reason why it is now transparent). It's a powerful moisturizing agent that leaves skin feeling moisturized! 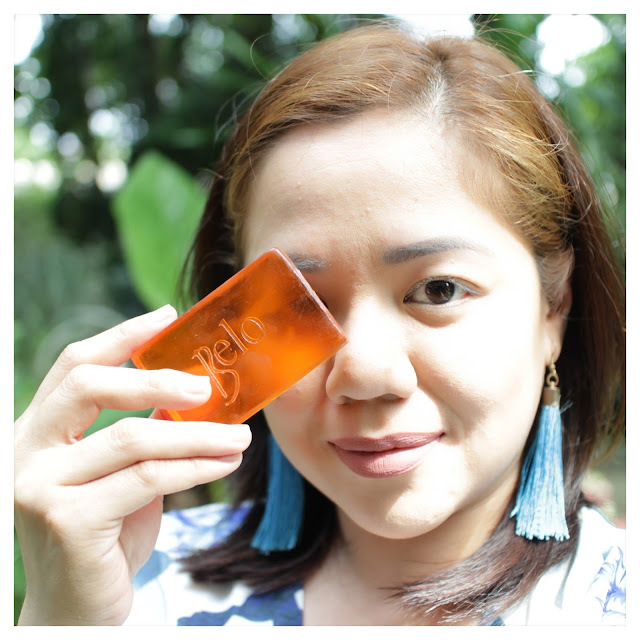 Now, personally for me soaps are truly for cleansing and an agent to start helping skin renew that's why I love the exfoliating effect of the original Belo Kojic Acid + Tranexamic Acid bar. As with anything you wash off, you truly leave your skin void of moisture. But that shouldn't always be the case especially with those legit skin concerns like dry skin. Belo Kojic Acid + Tranexamic Acid Extra Moisture helps prevent up to 42% moisture loss to the skin because of glycerin. And Glycerin as it is is a natural ingredient that is tolerated even by the most sensitive skin. I've been using this soap for months now and I think that the added ingredient did help with giving my skin a healthier look compared to a squeeky feel I used to have with the orginal Belo Kojic Acid + Tranexamic Acid bar. It feels refreshing as well but I'm so glad that effects of Kojic Acid + Tranexamic Acid weren't compromised. My acne dries up faster and my skin bounces back immediately to its fairer look. And I must admit, I like the fast that my skin lightens without the stingy-feel. The only downside I can think of about this soap is that it rans out faster than the Original Belo Kojic Acid + Tranexamic Acid bar. It's probably because glycerin to breaks down faster. 8. Can be used by people with dry skin! 9. Better for use all over the body! What not to love Belo Intensive Whitening Bar Kojic Acid + Tranexamic Acid EXTRA MOISTURE Bar. 1. It rans out faster than than the original bar. Why I love Kojic Acid? It's a great melanin-inhibitor and that means the less melanin you make, the fairer your skin is and allows your dark pigmentations to lighten faster. What's the added benefit of Tranexamic Acid? It's an amino acid and it helps with inflammation and dark spots. So if you have cystic acne, it can help flatten it and avoid it from darkening as it heals. It's an ingredient that's great for stubborn dark spots. 1. Discontinue other whitening brands for one week prior to use as this may not be compatible with Belo Intensive Whitening Extra Moisture. 2. Use twice dailly for the face and body. There may be sligt stinging and ichiness as the actives work in exfoliating the skin. 3. If prolonged irrtiation occurs, discontinue use. 4. Use with Belo Intensive Whitening Body Cream and Face and Neck Cream especially if you have dry skin.